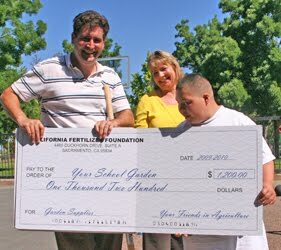 O'Hara Park Middle: Brian Brady, SMH teacher, recently applied for, and was awarded, a grant for $1,200 from the California Fertilizer Foundation. Pam Emery, representative of the Foundation, presented Brian and his class with a check, a shovel, a Home Depot gift card, and a supply of fertilizer to get their garden started. This grant will help fund a planned multi-layered campus learning garden. Plans for the garden include fruit trees, shrubs, fast-growing fruit vines, bulbs, and flowers. The garden, and its student-learning activities, will support facets of the school's curriculum on a daily basis. Above, Brian Brady and Sean hold the grant check presented by the CA Fertilizer Foundation. Liberty Transition students, Christine (left), Jonny (center) with Instructional Assistant (IA) Cheri Aranda, and David (above), love their work in the Liberty garden. Brian Brady plans to consult with James Koch, CBI teacher at Liberty High, on their new garden. Liberty is home to the first COE garden. Named in honor of former East County Student Programs Principal Evelyn LaTorre, the Liberty garden is a beautiful site to see, featuring fruit trees, flowers, and many types of vegetables. James holds a degree in conservation of natural resources with an emphasis on native flora of California, and brings a wealth of knowledge to the program. Left, Turner IA, Marlene Laisure, shows Malik the chard before the harvest. 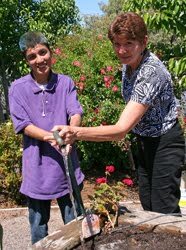 Teacher's assistant and volunteer, Harland (standing), from Sue Madole's Antioch CBI class, helps Sam with the hand trowel in preparation to plant their spring veggies. 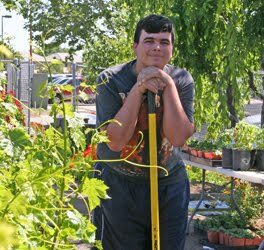 Turner School: Last year, Turner's garden project got off the ground with the help of Augie Marabuto of General Services, and Eloise Lovelace of Pittsburg CBI. Augie built the handicapped-accessible raised garden beds, and Eloise helped with raising garden donations. 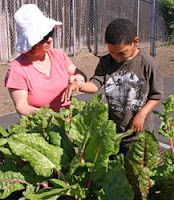 All of the classrooms at Turner participate in the garden, planting, weeding, and harvesting the bounty of vegetables which are enjoyed by students in the classroom, as well as the students' families and staff members. This year's winter garden included chard, spinach, cilantro, peas, cauliflower, broccoli, lettuce, and onions. "We are currently planting our spring and summer veggies," said Marleen Laisure, instructional assistant in Robert Keller's SMH class. "We look forward to enjoying tomatoes, carrots, bell peppers, string beans, and cucumbers with our students this season." Mauzy School: "Dave Verdin, our facilities worker, has worked very hard on the garden to get it ready for this season's planting," reports Paula Ramsey, office assistant at the school. "The tomatoes are in and we will be growing zucchini, beans, and herbs this season." MaryAnn Purcell's class is very involved in working the garden, as it is located right outside her classroom. 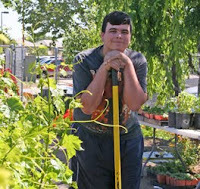 Delta Vista High School (DVHS): Students at DVHS are also learning gardening skills in their huge on-site garden. 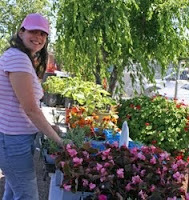 Annually, the Discovery Bay Garden Club collaborates with the school to provide plants for the garden. In addition, the club works closely with the boys in the garden. "There is a therapeutic aspect woven into their work with our students," said Lynette Martelle, instructional assistant at Delta Vista. "The volunteers teach the students how to love and nurture the plants, flowers, and vegetables. The hope is that the boys will learn gentleness and nurturing skills that they can apply to their life." Lynette shares that many of her students have benefited from their time in the garden. Their comments have included, "I love working in the garden... when I go home maybe I can help my grandma in her garden." Others have said, "I am going to have a garden and do this at my home. This will keep me busy, focused, and out of trouble." The harvested vegetables from the garden are taken to the kitchen for all of the residents and staff members on site to enjoy. We wish all of our sites a bountiful harvest this season! Eight employees of the CCCOE (along with business partners and outstanding students) will be honored at the 20th Annual End of the Year Celebration to be held at the Lone Tree Golf Course in Antioch, May 20. Congratulations to all of you for your recognition! 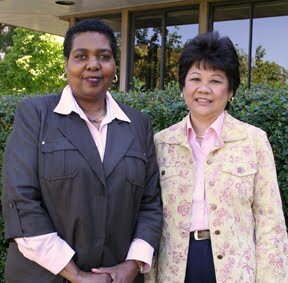 Above from left, Georgia Williams and Susan Lee. Las Lomas High Auto Shop. 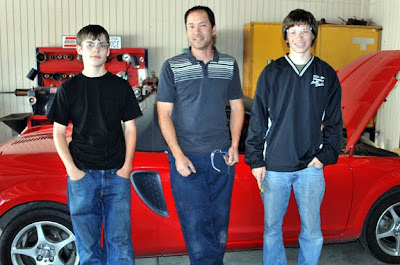 Two ROP seniors from Las Lomas High won first place in the Northern California division of the Ford AAA Student Auto Skills competition held at the Blackhawk Automotive Museum on May 7, 2010. The team of Alexey Fedorov and Lionel Kahn got a perfect score on the hands-on aspect of the competition, diagnosing and repairing everything that was malfunctioning on their test car, and scoring very high on the written test as well. As a result, they each won a $20,000 scholarship from Universal Technical Institute. This is the first time the Contra Costa County ROP Auto Tech students have won this annual competition. The purpose of the competition is to encourage highly qualified students to enter the field of auto technology. "Being part of this competition was a confidence builder for these students," says ROP Instructor Steve Boone. "It opened the door of opportunity for a career in the auto industry." Congratulations to ROP Instructor Steve Boone and his winning ROP students! Photo, top row: David Lambertson, Andy Renwick, Kristian Strotz, Nick Bublitz, and Daniel Baldwin. Bottom row: Shelby Lope, Kevin Mayo, Ethan Padilla, Matt Johnson, and James Hodgskiss. Not pictured: Will Grebe and Kyle Albert. Students from Michael Smidebush's CCCOE ROP Robotics Engineering class (pictured above) at Concord High took home three trophies in a Northern California spring competition, and qualified to go to the VEX World Championships in Dallas on April 22-24, where they won the Educate Award. The Educate Award is given to a team that has successfully integrated VEX Robotics into their Science, Technology, Engineering, and Math (STEM) curricula. The students were interviewed on several occasions by multiple judges. When the award was presented, the judges said, "This robot was built as a bi-product of the school's STEM curricula that encouraged the students with great enthusiasm to learn about robotics. Students proved themselves with great integrity and innovation to earn funding from the ROP sponsor for building their robots. The creativity and out-of-the-box thinking of the students was just an outcome of the school's sheer support through the inclusion of robotics in the curriculum." 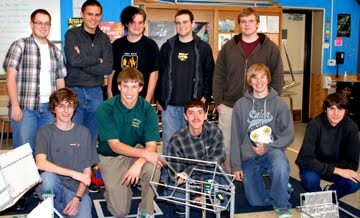 Congratulations to ROP Robotics Engineering Instructor Michael Smidebush and his Concord High robotics team!